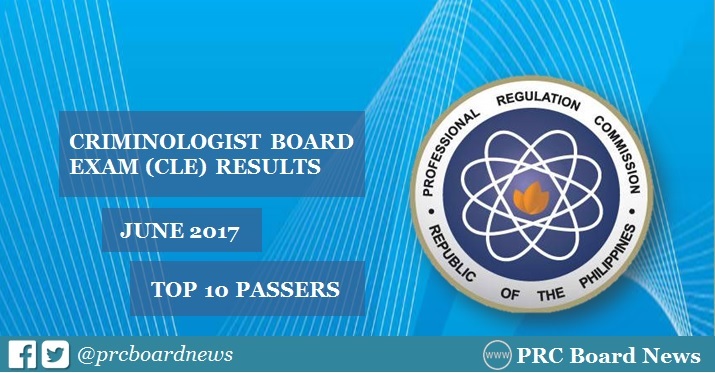 The official results of June 2017 Criminology board exam, which include the list of topnotchers or top 10 passers are available online on Friday, June 30 or in twelve (12) working days after the exam. Gander Suello Quillip from University of Mindanao (UM) - Digos College led the 5,202 passers, with 88.40%. It was followed by Matthew Tobias Solomon of ICCT Colleges Foundation Inc., 88.35%. Bestlink College of the Philippines graduate John Carlo FetalCorin Fetalvero is on third spot, 87.95%. The Criminologist licensure exam (CLE) was conducted on June 11, 12 and 13 (Sunday to Tuesday) in Manila, Zamboanga and all regional testing centers nationwide. On this page, the names of topnotchers, rank and rating will be posted. In the April 2016 Criminology board exam, Jared John Francisco Adolfo from University of Mindanao (UM) - Tagum topped the board with 88.15%. It was followed by Harold Tubongbanua Sarita of De La Salle University (DLSU) - Dasmarinas, 88.00%.